all you can drink microbrew + miracle berry tastebud tripping is the perfect combination for a raucously willy wonka evening! if you missed out on the first party, now is your chance to check out the latest foodie craze! your $35 ticket includes 1 miracle berry, a bacchanalian banquet of foods specially selected for the flavor tripping, and all-you-can-(safely) drink St. Arnold's beer! There will be 6 beers on tap including their seasonal Oktoberfest beer and the delicious St. Arnold Root beer too! [Edit:] A portion of the evening's proceeds will go to the Koonce Family Benefit Fund set up for James and Katherine Koonce who were critically injured in the Brennan's fire. Tickets are only available online as we expect the event to sell out before the event. There are a limited number of berries for this event as these fruit are extremely rare, highly perishable and hard to obtain in large volumes. Miracle berry tablets will also be available at the event for those looking for a more intensified berry trip. for more details or to buy your ticket online, go to http://www.theberryfairy.com/. the second annual "no holds barred" chili cook-off will be held on saturday, oct. 11 at the shady tavern in the heights. do you have a winning recipe? there's still time to get a cook-off team together! the team registration deadline is october 1st. "Our one rule is there are no rules. Unlike some of the more "official" chili cook-offs, we want our teams to really push the limits on style and taste. You can cook the chili off site and re-heat it or you can cook it from scratch; you can make red chili, green chili, yellow chili or blue chile(? ); you can use filler or no filler - JUST MAKE IT DAMN GOOD. The entry fee this year is $120 per team (4 people per team). That gets you 25 drink tickets (i.e. beers); 4 wrist bands to taste all the other team's chili; set-up costs for tables, bowls, spoons, etc. ; live music AND the most fun you'll find in Houston during the second weekend in October. We're working on fitting either koozies or t-shirts into the entry fee. The more teams we have, then it becomes more probably that there will be t-shirts. Last year we had 16 teams and we'd like to hit 25 to 30 teams this year." JUDGING. the event will have a panel for 4 judges: brandon, dock, yours truly, and fellow houston chowhound or "HouCH", katharine of sheeats and the houstonist. if the judges' votes tie, then a 5th vote will go to the public. the winning team will take 100% of the door fee. last year there were ~400 attendees which made the prize $2000 on top of bragging rights (priceless!). as of today, brandon says they have 13 teams and we want to double that number. so please help spread the word! more cheerleader than cook? have a deep rooted penchant for chili? or are you like me and see any "cook-off" as more of an opportunity to "eat-off"? general admission is a mere $5 to the event which gets you a wristband, a bowl, a spoon, and a vote. bring your appetite! chili should be ready around 1:30 PM. bibs are always welcome but not required. the event will go until 11 PM with live music and plenty of cold libations available. you(genious), the misfit of R&B, will be performing as well as others TBD. for more info, go to the NHB website or email: nhb AT gmail.com. my question is: has anyone tried making chili with sichuan peppercorns???? it should be no news to you by now that brennan's, our uppercrust creole eatery in downtown houston burned down early saturday morning last weekend while hurricane ike was quickly approaching. while the loss of this houston institution was tragedy enough, even worse consequences ensued. brennan's sommelier james koonce and 4 year old daughter katharine were critically injured, while general manager (and ex-executive chef) carl walker was severely burned. it is touching how the local restaurant community has reacted and are trying to help. catalan food and wine is offering a brennan's inspired tasting menu for $60 of which $10 will go to the koonce family fund. the menu was offered for the first time last thursday and will be ongoing for the foreseeable future. alison cook says the "4-course homage" to brennan's will include "crab and corn bisque; Gulf shrimp remoulade; blackened redfish over St. Arnold's local shrimp boil with "all the goods"; and New Orleans style bread pudding topped with whiskey sauce." gravitas restaurant, negociants USA and prestige wine cellars will be hosting a wine tasting fundraiser on monday, september 22 from 1:30 - 4 pm. negociants' icon release wines will be paired with seasonal appetizers. please donate generously as all proceeds benefit the Koonce family. please RSVP to david maib at 713.962.9085 or email dmaib@negociants.com or yolanda@gravitasrestaurant.com. del frisco's, who donated so generously during houston restaurant week to benefit the end hunger network, will also be hosting a koonce benefit sunday, september 28 from 6 - 9 pm. the event will be held in their gorgeous wine cellar where they will be pouring wines from silver oak, far niente, cakebread, duckhorn and pommery. light fare will be served including andouille-stuffed goat cheese mushrooms, barbecue shrimp, sliced tenderloin, and mini crab cakes. the cost is $50 per person and 100% of the proceeds will go to the koonce family fund. brennan's executive chef randy evans will be in attendance. please call del frisco's at 713.355.2600 to reserve a spot. please find a way to contribute to the cause. the houston chowhounds are brainstorming on how we can donate to the cause too. i'd say i've eaten pretty well since i've been back from LA. the lake house, brasserie max and julie, fu fu cafe, and houston's. i tried to get my pho fix in midtown yesterday but no vietnamese joints were open. headed to chinatown and most places are still closed except some restos in the dun huang shopping center and sterling plaza across the street. pork and chive dumplings at fu fu cafe. himalaya is open and the chowhounds and i are headed there for lunch tomorrow! cafe brasil (has wifi) - suspicious of this one. cafe brasil has never had wifi. call and check first. if you know of any others, please post below. i'm heading back to houston today after almost 3 weeks in LA. i am told my townhouse sustained the wrath of ike with no damage, the cats are happy and healthy, but i am still without power. hence, i don't see any home cooked meals in my future. you guys are probably pretty hungry by now too or longing for some grub that is more organic or doesn't require the use of a can opener first. here is a list of neartown/downtown/montrose/upper kirby restaurants that have been reported as open on the houston chronicle or houston press' websites. note: some of these businesses may be serving a small or limited menu and may not even have A/C. if you know of any other restaurants open in the area, please post it below as a comment. the houston chowhounds and i will be meeting downtown for lunch at the lake house on discovery green tomorrow. our inside source tells us they will be resuming operations tomorrow at 11 AM. what better time than now for some hot comfort food while sitting around with friends enjoying the nice post-hurricane temperatures? i told myself i wouldn't waste valuable stomach space with mexican food in LA since i can get a plethora of it at home anytime i want. but after a week here, i broke down and boy was i glad that i did. check out two amazing breakfasts that i had. the first was at good microbrew & grill. the occasion was sunday brunch and there were a variety of menu items that sounded tempting to order. 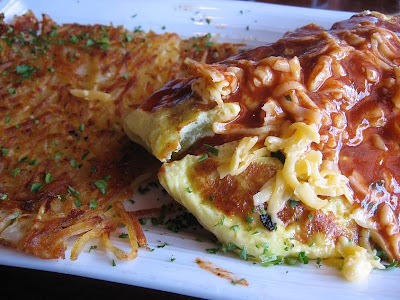 but as soon as i saw the enchilada omelette, i knew it was blogworthy material. no fancy food here. just comfort at it's finest. ooey gooey cheese enchiladas wrapped in fluffy eggs topped with enchilada sauce and more cheddar on top. it tasted as good as it looked. a few days later, the hankering for comida resurfaced and i popped into tacos delta for what i expected would be a greasy, yummy breakfast. 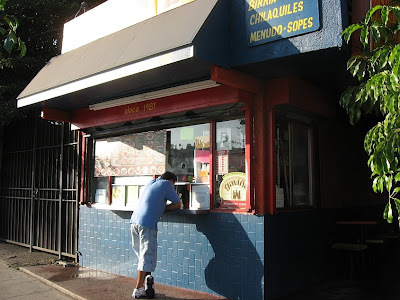 this little taco shack sits on w. sunset and is also in silverlake. we had driven by it a few times before and i noticed people standing in the walk up window ordering. this particular morning, i saw several hispanic people waiting in the parking lot for it to open. i figured it was worth checking out. 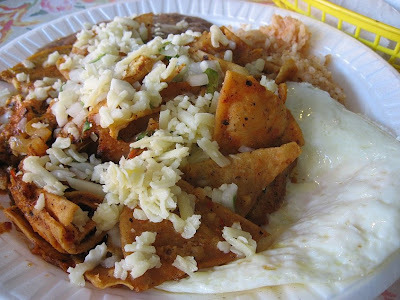 i ordered the first thing on the breakfast menu: chilaquiles con huevos. i took a seat in the outdoor dining area behind the taco shack. it was a hefty plate of food. chilaquiles, 2 eggs over medium, compulsory rice and beans. 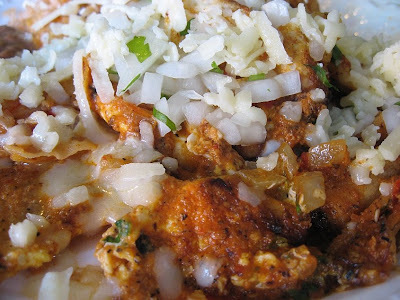 close up of the chilaquiles. the tortilla chips were thick and still crunchy. they were fried with scrambled eggs and some sort of meat or beans that gave it an excellent char and flavor. a generous sprinkling of chopped white onions and cheese on top finished the tasty dish. i have to say i've never had better chilaquiles anywhere else. here's a LA chowhound thread about the local chilaquile action. somehow i managed to stumble over some of the best in the city. houston's chinatown is wonderful for all intensive purposes, but the quality, level of culinary skill, and creativity of really amazing dim sum does not exist. when i plan my L.A. trips, i look forward to a dim sum brunch which i think is better than the stuff i've eaten in manhattan and san francisco. in the los angeles area, the best dim sum restaurants are in san gabriel valley, about 10 miles east of the downtown los angeles. 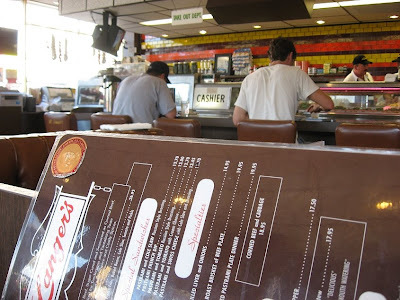 on past LA trips, i've visited elite and 888 seafood restaurants. i wasn't too impressed by elite. today, based on chowhound.com reviews and some local LA blogs i've been reading, i decided to head to sea harbour which many claim is the best dim sum in L.A..
the wait for a table was an excruciating hour and a half on labor day monday. we arrived at 11:30 and received a number. they didn't tell us how long the wait was for a table and after almost 45 mins of waiting, the painful realization hit that they weren't even halfway to our number. we got a table around 1 pm. by that time they were out of some dim sum items. mad props to my friends who agreed to wait it out. i did notice that the large parties (5-8 people) were sat more quickly than our small party of 3.
dim sum is an off-menu affair at sea harbour. 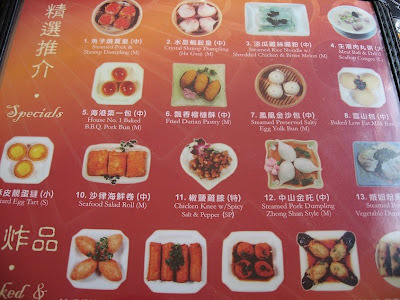 no push carts here but the regular menu has photos of every dim sum item which is also labeled with a number. the order form. 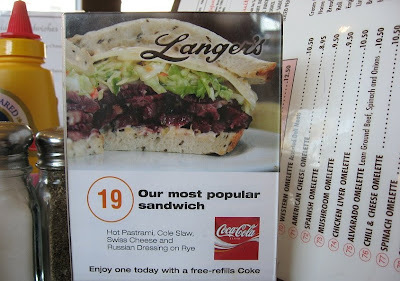 just correlate the numbered photos on the menu to the numbers on the order form and check off what you want. seasonal specials are stapled to the bottom of the form, but they are all in chinese. i could make out a few words but not enough to know what anything was. 39. steamed egg tofu w/fresh scallop in dry scallop sauce. the custard was light, very soft, and creamy. the steamed scallop was a little fishy the way steamed scallops inevitably taste. 63. french style goose liver wonton. in the photo on the menu, they looked fried. we ordered half a dozen. i actually sent back this dish when it was brought to the table b/c i didn't recognize it as something i ordered. i didn't know they were served in soup and 95% of the wontons were filled with shrimp. the tiny bit of foie was discernable and the wontons were delicious. this dish alone made the 20 mile drive and 1.5 hour wait for our table worth it all. inside view of a foie gras and shrimp wonton. see the tiny piece of foie gras at the bottom? who knew how delicious fois gras would taste with shrimp? 11. chicken knee (cartilage) w/spicy salt & pepper. 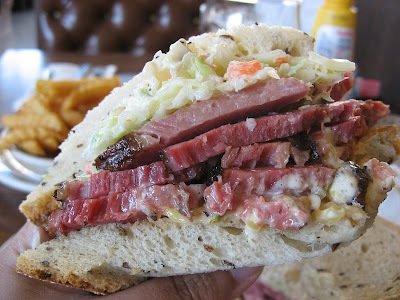 i first had this dish at elite in monterey park. the pieces of chicken cartilage were much larger and had more tender bits of meat and/or tendon here. i couldn't stop eating them because they were so tasty and crunchy, but not very spicy at all. 69. poached gai lan (chinese broccoli). perfectly cooked. 17. eggplant stuffed w/shrimp paste. japanese eggplant was soft and tender, the shrimp stuffing was firm. the sauce was slightly sweet and sour. excellent composition and taste. 35. spareribs in black bean sauce. piping hot, fatty, juicy, and delicious! getting them this hot is definitely an advantage over the pushcart dim sum experience. 45. fresh shrimp dumpling w/chives. large pieces of shrimp inside which makes a chewier dumpling. they were out of the steamed shrimp and pea tips dumplings so we ordered these. good, but i bet the pea shoot dumplings are better. 1. steamed pork and shrimp dumpling (shu mai). very large, firm, and meaty. definitely the best i've ever had. 47. steamed juicy pork bun (soup dumplings or xiao long bao). come 4 to an order sitting in tiny aluminum pans to prevent soup leakage. delicious but not nearly the best i've had. inside the lotus leaf is ground pork and preserved duck egg yolk. i love sticky rice and this version was no exception. 44. shark's fin scallop dumpling. the shark's fin is the stringy stuff on the crown of each dumpling. there wasn't much. just below the shark's fin is the sliced scallop which sits on top of a giant shrimp dumpling. i was a bit shrimp dumpling-ed out by this point. i also decided that scallops are so much better seared than steamed like this. this scallop was a bit fishy tasting too even though i had no doubts that it was very fresh. 9. custard egg tart. the pastry was light and flakey. the custard was rich, creamy, and still warm. i loved the custard to pastry ratio of these tarts. warm tarts is something you will be hard pressed to get at a pushcart dim sum place. we all agreed that the wait was worth the food. and i have to agree that this is the best dim sum i've had in L.A.. very, very impressive. 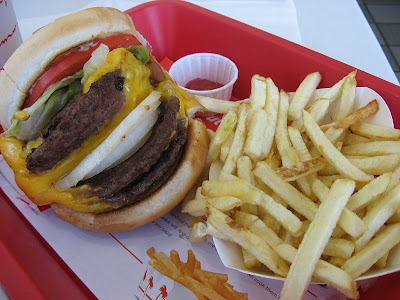 tetsujustin told me to go eat a 4x4 at in-and-out burger for him while i was in L.A. i actually had an in-and-out burger before in pasadena, CA about 9 years ago and truthfully don't remember being that impressed. but my hangover this morning was screaming for some grease and i thought it was about time to give it another go. after some preliminary research i found out that the 4x4 was a burger with 4 patties and 4 slices of cheese off their secret menu. i felt daunted by it and i'm not much for eating as a sport, but still a little hazy from a night of heavy drinking, i left the house to go meet D. there. she said we should wait until at least 1:30 to avoid the lunch crowd. we got there right about 1:30 and the parking lot was packed. the drive thru line was at least 15 cars deep and snaked around the parking lot. there were employees taking orders with wireless handheld terminals as cars pulled up to the end of the line so they could get orders in before the cars even made it across the lot to the actual building itself. the lot was full too so there were cars just sort of hanging out waiting for spots to open. the drive thru line was obstructing other cars from pulling out or in. it was a mad situation. we found a parking spot right away (due to my amazing parking karma) and headed inside. the joint was packed. we found a line to stand in but it went quickly. the menu is one of the simplest i've seen: burgers, fries, milkshakes, and a few other beverages. it was even fun ordering the 4x4 - the kid behind the counter looked surprised and then gave me a look like, "yeah, go for it." we waited almost 10 mins for our food to come out. 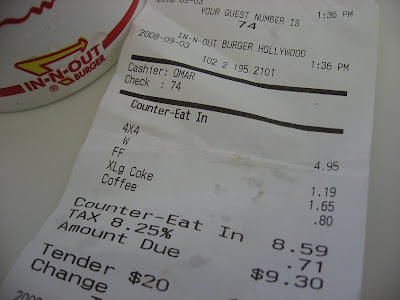 this is how my order looked in the cute in-and-out burger trays. this is the 4-by-4. 4 beef patties, 4 slices of american cheese. 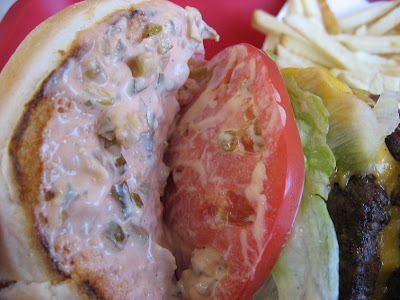 freshly baked and grilled bun, special sauce, generous tomato, lettuce, and onion. here's a close up. the burger was delicious and really hit the spot. 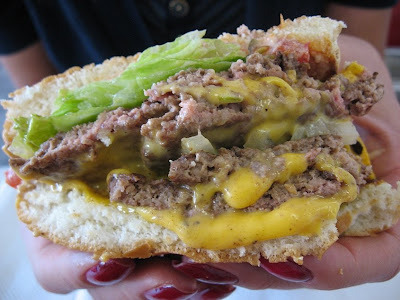 there was so much cheese, it oozed out of the burger. it had lots of onion on it the way i like it. the creamy 1000 island-esque special sauce was tangy and yummy. 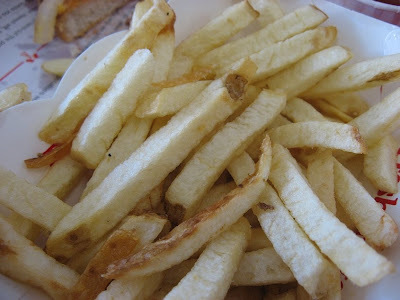 the fries were too cold by the time i dug into them. 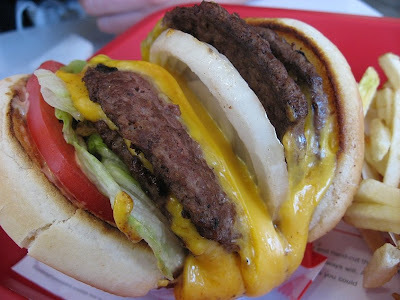 i tasted the lightness that in-and-out fries are known for but the temperature of them just killed it for me. 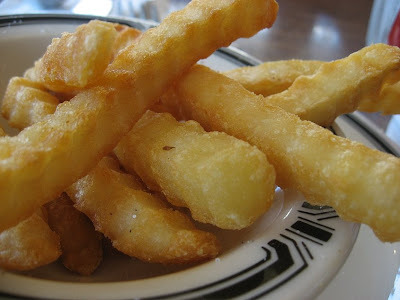 fries should be hot and crispy and these weren't. i thought about sending them back, but then i was worried my burger would get cold. i couldn't make it out here during my last trip to L.A. because it was quite a drive to east L.A. i heard it wasn't the safest neighborhood either, so i needed a friend in tow. the drive alone here was fun - admiring the local hispanic community landscape which included vibrantly colored storefronts and signage and wild wall murals. the very awesome A. who has lived in L.A. for many years was even entertained by the drive through the "hood" for what i have researched as "the best fish taco in LA." the rec actually came from dorothy, ex-LA chowhound (SCARF) now moderator for the houston chowhound yahoo group. all her LA recommendations are taken very seriously. the front door. notice it got an A rating from the health inspector by the sign in the window. why is it that i expect the really yummy ethnic dives to have at least a B- or C? no air conditioning inside, but lots of outdoor seating. my two tacos and campechana. close up of my tacos. shrimp taco on the left, fish taco on the right. taco de pescado close up. the fish was battered, fried and tasted amazingly light and crispy - not greasy at all. i was VERY impressed. i loved the finely chopped cabbage and the addition of fresh tomatoes and red onion. cream sauce and red sauce were both good. i would have liked more cilantro, but was too lazy to request it. taco de camaron. this taco was good too, but the shrimp were slightly overcooked and not as crispy as the fish. the texture and flavor of the fish taco was much more enjoyable. campechana. i've had a lot of campechanas in houston that have had way too much ketchup in them. this is the first one i've had that i wanted more ketchup in. after the addition of mexican hot sauce, it was more palatable. the seafood was fresh, however everything tasted a little too chewy and the sauce too watery. the campechana contained avocado, shrimp, octopus, fish, scallops, and clams. 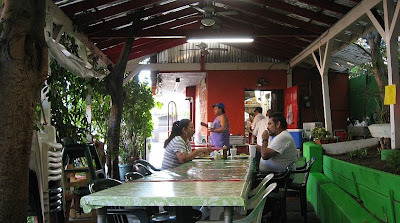 i definitely recommend tacos baja ensenada for the food and the experience of visiting the neighborhood. we have a huge population of hispanics in houston, but no one part of town which so proudly displays their culture. the next day, the very awesome A. took me to rubio's, a popular fast food chain which started in san diego and is known for their fish tacos. A. liked TBE but preferred rubio's salsas and wanted to take me there. we went to the marina del rey location. here is their fish taco especiale which is served on 1 thicker corn tortilla (opposed to 2 thin ones that i usually see). the tortilla had a rubbery texture and tasted store bought. the taco was "special" due to the addition of guacamole, jack and cheddar cheeses, and onion/cilantro mix, but there was barely any discernable cheese, onion, or cilantro and an embarrassingly miserly amount of guac. this taco which predictably wasn't as good as tacos baja ensenada was still a gajillion times better than berryhill's fish tacos in houston. the fried fish, green cabbage, and white sauce combination was tasty. onion cilantro mix, which i manually added, was gratis from the condiment bar and also included several salsas to choose from: smokey chipotle (a little too smokey for me), salsa picante (nice heat), and salsa verde (skipped). some restaurant reviews are just so pleasurable to write b/c you get to relive the whole experience. 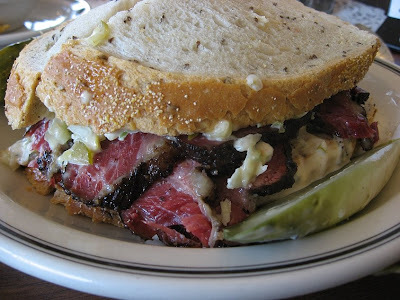 one such example was my dinner at providence in L.A. last week. i had heard of this restaurant before but after so many houston chowhounds declared their undying devotion to chef michael cimarusti, the place shot up to the top of my L.A. restaurants to check out. this modern seafood restaurant was also awarded a michelin star last november. amuse bouche. gin and tonic gelee topped with lime powder, mojito raviolo, and chilled fennel soup with warm saffron syrup. each taste inspired large smiles at the table. the mojito raviolo was the most fun as it burst and released a mouthful of cold and delicious mojito. i am one to always appreciate a little free booze thrown my way too. first course. japanese kanpachi w/ red shiso granité, olive oil, cucumber blossom, and salted plum sauce. the kanpachi was extremely velvety and the fish really shined through despite all the other ingredients on the plate. the granité kept the fish cold and when it melted, it mixed nicely with the plum sauce garnish at the bottom of the plate providing a less viscous sauce and more subtle salted plum flavors to dip the raw fish into. second course. bobby's block island sea scallops w/ chanterelles, chayote greens, pistachios, and aged balsamic vinegar. i love the flavor of white pepper and enjoyed it in this dish. it accentuated the earthiness of the mushrooms and pistachios. the chayote greens, which i have never had before, were delicious. the balsamic added just the right amount of acid to brighten the dish. EXCELLENT! third course. british columbia wild halibut with crispy burdock, red shiso leaves, sake butter sauce and sake espuma. if chef cimarusti is still doing foams, i guess we aren't getting away from them any time soon. this course was my favorite of the evening. the fish still looked a bit translucent, yet the texture of the fish was too flakey to still be raw. it was pure silk on my tongue and melted in my mouth. the sake butter sauce was delicate and yet still decadent. the pungent shiso punctuated several bites that it was included in. this is hands down the best cooked fish dish i've had. i was literally dancing in my chair by the time i finished the plate. fourth course. veal tenderloin w/ king oyster mushrooms, tomato confit, spring onions, and brentwood sweet corn puree. the veal was so tender i could cut it with a fork. the mushrooms were steaky and as such worked well with the onions and red meat. the corn puree was surprisingly naturally sweet and added beautiful color to the plate. the dish was very good. the texture of the veal was very memorable. fifth course. passionfruit curd topped with "scorched" meringue. carrot cake with cashew streusel. the dish was too weird for me. the "carrot stick" was a stick of white cake soaked in carrot and ginger puree. it tasted too much like bitter carrot concentrate for me to like it. the passionfruit curd was too sour for my palate although my dinner companion enjoyed it. chef michael cimarusti stopped by the table when we were done after a bit of chatting and Q&A, i found out that both the halibut and veal were cooked in a CVap to get them so tender. CVap or controlled vapor technology, which was first invented to keep kentucky fried chicken fresh, is a controlled humidity oven that uses moist heat to cook at extremely low temperatures. the theory is similar to a sous-vide (or immersion circulator) but without all the fuss of air-tight bags and water baths. everything about the evening was special beginning with the drink at the bar while watching the bartender squeeze fresh citrus and cut elaborate garnishes for drinks, to having the host fit us in b/c my reservation was somehow lost, to the somm finding us a couple bottles of nigori or unfiltered sake that he happened to have in the cooler that wasn't on the wine list, and ending with our dialogue with the chef. the restaurant had a modern yet warm, casual appeal and service in the dining room was attentive and professional. the five course tasting menu took over 2 hours and really seemed to drag on. i'd love to come back to do the full 12 course tasting menu another time or even the iron chef menu that cimarusti beat morimoto with just days ago. finally a place that lives up to all the hype! 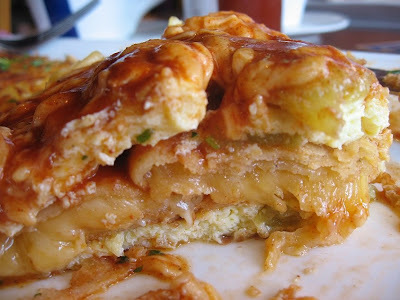 i didn't know it when i left providence, but in the morning i would be eating more cimarusti's food for breakfast. more details on that breakfast to come, but until then, i'll leave you with a snippet of the iron chef america episode for your enjoyment.